The timeless classic “The Nutcracker” -- with a Laramie and Western theme -- will be performed Thursday-Saturday, Dec. 11-13, at 7:30 p.m., and Sunday, Dec. 14, at 2 p.m. in the University of Wyoming College of Arts and Sciences auditorium. The UW Department of Theatre and Dance sponsors the family holiday favorite. Tickets cost $16 for the public; $13 for senior citizens; and $8 for students. For tickets and information, visit the Wyoming Union or Performing Arts ticket offices, call (307) 766-6666 or go online at www.uwyo.edu/finearts. This classic ballet fantasy is about a young girl, Clara, who receives a nutcracker for Christmas that spurs her fantastical dream. Based on the 19th century German fairy tale by E.T.A. Hoffman and featuring Tchaikovsky's dazzling score, “The Nutcracker” comes alive with dancing snowflakes, magical mice, marching soldiers, waltzing flowers, the Sugar Plum Fairy and the Nutcracker Prince. UW dance faculty member Marsha Knight choreographed and directs the production, accompanied by the UW Symphony Orchestra, directed by Michael Griffith, and the UW Lab School Treble Choir, directed by Jennifer Mellizo. Knight first decided to produce the ballet, on a limited scale, in 1988, setting it in the romantic “Old World” style typical of most “Nutcracker” productions. Beginning in 1994, the UW Department of Theatre and Dance began to present the ballet every four years, a massive undertaking involving many local children and community members, Knight says. “‘The Nutcracker’ was very much a part of my training as a young dancer, and I appreciate the chance that we provide for children in the community to experience being a part of the production,” she adds. 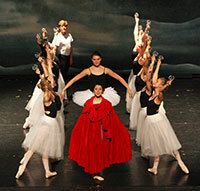 UW’s “Nutcracker” grew in scale and scope with each production, but after 2002, it was clear that many costume pieces and scenic elements needed replacing. Lee Hodgson, UW costume faculty member, saw this as an opportunity, proposing that UW’s “Nutcracker” take a new direction, one unique to Laramie and the West. The design team and Knight began resetting the ballet in 1890s Laramie in the Ivinson Mansion and its surrounding grounds. Research conducted at the Laramie Plains Museum, with Joney Wilmot and Mary Mountain, formed the basis of Hodgson’s costume designs, while the Ivinson Mansion itself inspired the set designs. Since 2006, Hodgson has recast the Stahlbaum family of Germany or Russia as the Ivinsons of Laramie, with mice modeled after the Hole-in-the-Wall gang, soldiers after the U.S cavalry, and even Mother Ginger and her gingersnaps after cowgirl and Indian princesses. Noted scenic artist Ron Steger, professor emeritus in the department, in 2006 was commissioned to paint three new drops reflecting the interior and exterior of the Ivinson Mansion, as well as to design new scenic elements. That work was augmented in 2010 by the addition of three new portals, a vista of the Laramie Valley (inspired by M.D. Houghton), and a new Act II drop. For this year’s production, updated costumes have been created for the Sugar Plum Fairy, Snow Queen, Mechanical Doll and Soldier, Mother Ginger and her Gingersnaps, and the Angels. The Act I Christmas tree has been redesigned, and several scenic elements have been updated to fit the “Western” theme. New winding staircases have been added for the soldiers in the battle scene, reminiscent of the winding staircase at the Ivinson Mansion. There also is a beautiful new sleigh, used in the Snow Scene and appropriate to the Laramie setting. A new doll cabinet -- from which the Mechanical Doll and Soldier appear -- has been built with saloon doors, and the cannons have been redesigned. “The Nutcracker” had its premiere in 1892 at the Maryinsky Theatre in St. Petersburg, Russia, with choreography by Marius Petipa and Lev Ivonov and Tchaikovsky’s score, but was not well received. It was first performed in the United States by the San Francisco Ballet in 1944, but did not become a holiday tradition until 1954 when revered American choreographer George Balanchine produced “The Nutcracker” with the New York City Ballet.